February 22nd is officially Walking The Dog Day! That’s right–your dog’s favorite pastime has an official Internet holiday. Whether it’s your dog waking you up at 5am to take them out, or making you take them out just as you get home from work, dogs just can’t seem to contain their excitement about going for a walk. Even describing the following dogs as “excited” is a bit of an understatement. One simple daily activity can seriously change a dog’s life. Remember, it’s extremely important to a dog’s health to make sure they have daily exercise, so make walking a daily part of their routine. Check out these pups going bonkers for walks in honor of Walking The Dog Day! Haley is just thrilled to go for a walk–so much so that she can barely even slow down enough to get ready. She, of course, has to grab her collar and leash, and that’s pretty tough when your brain is doing a happy dance. With a little help, she finally manages to fetch her equipment, but then she has to do some tricks before walking out the door. All the tricks. In fact, she doesn’t even wait to hear the words “roll over” before she does a perfect roll. Finally, she’s ready to go! This dog is so eager to take a walk that he starts walking his doggy friend with his own leash! He can’t take waiting for his lazy humans any longer, so he figures he might as well just take control. He keeps stomping his feet up and down, holding on to the leash while looking lovingly at his owner, not realizing that he needs to have his own leash on before anything can happen. It’s adorable that he not only wants to go for a walk, but he wants to make sure his buddy comes with. Every time this dog’s owner gets home from work, it’s the same routine. He walks in the door, and immediately his doggie cannot stop barking because she knows exactly what is about to happen. Ironically the moment he steps in the house from work means he has to leave the house immediately again to go for a walk. But how could you deny this dog a walk, she is just so happy. It’s no doubt that this dog loves her daily routine. The moment this Boxer hears the word “walk,” he springs into action–literally. It’s as if the word ‘walk’ is a command to start hopping like a bunny. 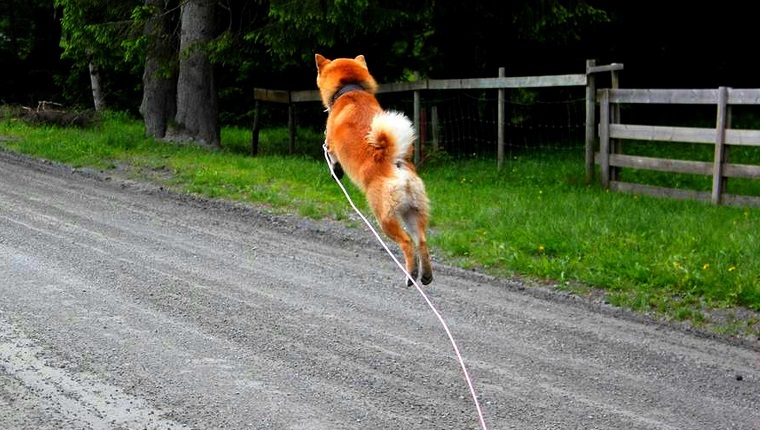 Every time the owner says ‘walk,’ he springs into the air uncontrollably, acting like a reincarnation of a rabbit. A simple leisurely activity can get this dog so incredibly excited that he jumps like an actual rabbit. Ziggy Trixx is a pretty smart pooch, especially when there are walkies for a reward. This pup is happy to fetch his leash, coat, and collar, all with a big, Pittie smile on his face. It’s no wonder Ziggy went viral with this performance, but he doesn’t care about that. He’s just happy to get some exercise with his human. A true good boy, indeed! Both Coop and Katie love to go outside and go for walks, but Coop’s behavior in particular has become quite predictable. In this funny video, the owner has gone through this situation so many times that he knows exactly how Coop will act when he says the word “walk.” His prediction is spot on, as Coop first tilts his head, then waits a moment, gets excited, and starts screeching, licking Katie’s face, and finally jumping up and down. This compilation features every type of dog reaction to going for a walk. You have your barkers, your tail wagers, your jumpers, your stompers, and even your head nodding dogs. It’s hilarious, and actually quite amazing, how many different types of reactions there can be to one single word. Just make sure you don’t have your dog in the room with you while you’re watching or they’ll get excited just from hearing the word come from your computer speakers! This Bichon Frise has no patience when it comes to waiting for a walk. He will even do tricks without being asked just to get his owner’s attention. In this clip, when his owner asks him to lie down, he suddenly rolls over perfectly just because he thinks it will help him go for a walk. According to the owner, he can’t play this video around his dog or even say the word “walk” in conversations without his pup going bananas. This Siberian Husky‘s reaction to a walk will have you in stitches. First, he beats his owner to the front door, racing down the stairs before he can catch up. Then the hilarity really begins. Before the owner even touches the leash, the Husky starts wailing and howling. That’s the moment when even the neighbors probably know that this pup wants to go for a walk. How do your dogs react when they want to go for a walk? Are you going to take them for a nice, long walk on Walking The Dog Day? Let us know in the comments below!